So grateful for the gift of new life! My name is Patrick McEntee and I am a 43-year-old man who received a life-saving heart transplant on August 13, 2017. I was diagnosed with cardiomyopathy in 1996. Nine years later, a series of heart related illnesses began with two strokes and a heart attack. Ultimately, my heart muscle continued to weaken from congestive heart failure to the point I was sent for a heart transplant evaluation. I was admitted to the Cleveland Clinic at the conclusion of the evaluation so doctors could try adjusting my medications. That was unsuccessful and within a week, I was listed to receive a heart transplant and my condition was so dire that a Left Ventricular Assist Device (LVAD) was implanted. This device gave me a much higher quality of life and bought some extra time needed to bridge me to a heart transplant. My faith is very important to me and led me to a career path that included time as a youth minister, retreat leader, college and high school campus minister, high school religion teacher and a vocation minister. These areas of ministry have led me to live in four states, and also led me, in a very indirect way, to meet my wife Amy. We met in 2001 at the University of Dayton and were co-workers, but several years after graduation, our friendship grew to love and we were married in 2010. Amy has been such a blessing and has definitely lived up to the “in sickness and in health” marriage vow. Because of my LVAD surgery, I had to leave my position with Glenmary Home Missioners to await a transplant. I am filled with hope about the future and can’t wait to see what ministry God will lead me to when I receive my new heart. My LVAD and the subsequent regular visits to Cleveland to prepare for transplant have already created a significant increase in our expenses. Since I am unable to work, our income has been lessened as well, so there is a growing need for financial help that will only increase as the time for transplant comes. Regular visits to Cleveland Clinic for appointments will continue until the time of transplant, and beyond. There will also be an extended period of time where Amy or another family member will need to stay in Cleveland to be my caregiver. We have chosen to fundraise with Help Hope Live in part because Help Hope Live assures fiscal accountability of funds raised and tax deductibility to the full extent allowed allowed by law for donors. Donors can be sure that funds donated will be used only to pay or reimburse medically-related expenses. To make a tax-deductible donation to this fundraising campaign, click on the Donate Now button. Thank you for your prayers, support and generosity. Keep an eye on the website for updates and any upcoming fundraisers that will be planned. I am so grateful to my donor Bob for the gift of new life he gave me. He allowed me to attend and compete in this year’s Donate Life Transplant Games of America. While I was unable to bring back a medal, it was fun to compete for the first time since I had to give up softball more than a decade ago. As it turns out, my new heart didn’t come with any additional athletic ability or coordination. So no medal, but a trophy case full of memories…oh and a Guinness World Record! I was one of 540 solid organ transplant recipients in one place at one time at the closing ceremonies of the Games! Thus, I and 539 new and old friends are officially in the Guinness Book of World Records. But really, the joy of the week in Salt Lake City was about the people – recipients like me, living donors, donor families, those waiting, caregivers, supporters and more. Heck, even Mitt Romney made an appearance one evening to watch some volleyball! On my first day in the Salt Palace convention center, I ran into Russ Maynard from Team New England. I immediately recognized him, and he recognized me. Russ saw me struggling with my LVAD in the 2016 5k and he walked with me for a time and motivated me to power through and not cut short the race. I kept going, falling further and further behind the crowd until there was no one left in sight from the race. As I turned the corner for the final leg, Amy came back to walk with me after finishing her race. When we approached the finish line, Amy rallied a crew of people to cheer me to the finish line. Among them was Russ who walked with me to the finish line. It was so great to see him and catch up and show him that I didn’t have the LVAD anymore, but this beautiful new heart that allows me to finish these races in roughly half the time. I also got to see Jenny again and meet her mom Dorothea (Russ’ wife). It was wonderful sharing stories with others who have walked a similar road as me. Despite that fact, each story is completely miraculous in it’s own way. That’s the magic of organ donation. It saves lives! It continues stories! The Transplant Games of America are upon us and I leave for Salt Lake City, Utah Wednesday morning. I’m so excited and so nervous. This will be my first time on an airplane in nearly five years. Two years ago, the Games were a lot closer (Cleveland). We had a great time, but I was missing a key component to be eligible to compete…a transplanted heart. This time, I am eligible and hopeful I can manage to snag a medal in one of these five events: 5k race (no chance of medaling), Texas Holdem (it’s a game of chance, so who knows? ), Trivia (I’ll be on a team of five, I am a font of useless information, so this is probably my best bet), Badminton and Darts. I have little to no skill in either of these. I’m just hoping not too many in my age group and I can sneak a medal. More so than the Games, it’s great to meet people from all over the country to swap stories and make new friends. I’ll be posting a lot of pictures and hopefully videos on Instagram and Twitter @journey4ce as well as on Facebook. Follow along if you like! Here is the video from my first pitch on July 13, 2018. It’s really great…up until I throw a worm burner. Thanks to all those who came out to see it! Today begins what will become a month long celebration of my re-birthday. This evening, I am throwing out the first pitch at the Dayton Dragons baseball game. Tomorrow morning, Several of us who will be at the game tonight, will be driving to Columbus to compete in Lifeline of Ohio’s Dash for Donation. This will be my fourth 5k since my transplant. Each 5k I compete this is in honor of Bob on what I am dubbing the #ThanksBobTour. On August 1, I will be flying off to Salt Lake City to compete in the 2018 Donate Life Transplant Games of America. There, I will compete in the 5k, Texas Holdem, Darts, Badminton and Trivia. When I return, I will shuffle off to Cleveland to compete in Lifebanc’s Gift of Life Walk/Run on August 12. This will be the anniversary of the day I got the call that a heart was a match for me. Finally, on August 13, I will celebrate my transplant anniversary by having my one-year follow up biopsy, testing and appointments with my doctor. In other exciting news, a couple of weeks ago, I received an envelope that contained a letter from Lifebanc and another from UW (Wisconsin) Organ and Tissue Donation where Bob’s heart came from. The letters indicated my someone in my donor family wanted to contact me directly rather than through the OPOs. I sent in my information and am waiting to receive theirs. I imagine it will come any day now. What a month this is going to be! Please continue to pray for Bob’s family as they are most likely approaching this next month with much more dread than joy. I’m sorry to have been so neglectful of updating my page. I can’t believe it has been so many months since i updated. Many of you have followed along on Facebook and many updates have been passed along that way. Since my last update, I have continued to get stronger. I have remained active. Despite my regular exercise and activity, I am fighting weight gain, which is an unfortunate side-effect of Prednisone. This drug is a steroid which acts as one of the three anti-rejection medications I take to keep my body from rejecting the heart. The good news is that my dosage has been weaned down. I left the hospital taking 20 mg per day of Prednisone. After yesterday’s biopsy, which netted me a 0R (which means no rejection was noted by the test), my dosage of Prednisone was dropped to 5 mg. If all goes according to plan, I will be off it altogether by Thanksgiving. I have completed two 5k races since my transplant. The last one, I finished in 54:10, which meant I shattered my goal of finishing in under an hour. My next race will be the Redlegs Run followed by several races run by OPOs which I dedicate to Bob. I have become something of a local celebrity as a result of my transplant. I got to promote organ donation and be honored on the court at a University of Dayton game in January. I also made the news that night, which led to a couple of calls the next day from people I have met at Cleveland Clinic and at Cardiac rehab. In April, I volunteered nearly every day between Life Connection in Dayton and Life Center in Cincinnati. These volunteer events included giving speeches at Flag raising ceremonies at area hospitals for Donate Life month, speaking in high schools and at an event honoring donor families who lost a loved one in the past year. Amy and I also got to be on the radio program “Cincinnati Edition” on WVXU talking about our experiences of organ donation. August will be a busy month and it will kick off by flying to Salt Lake City for the Donate Life Transplant Games of America. Hopefully I can bring home a medal with me. After I return, I will participate in the Gift of Life Walk/Run in Cleveland. This will take place on a very important day: August 12. That is the first anniversary of “THE CALL.” On Monday, August 13 I will have my one-year checkup. 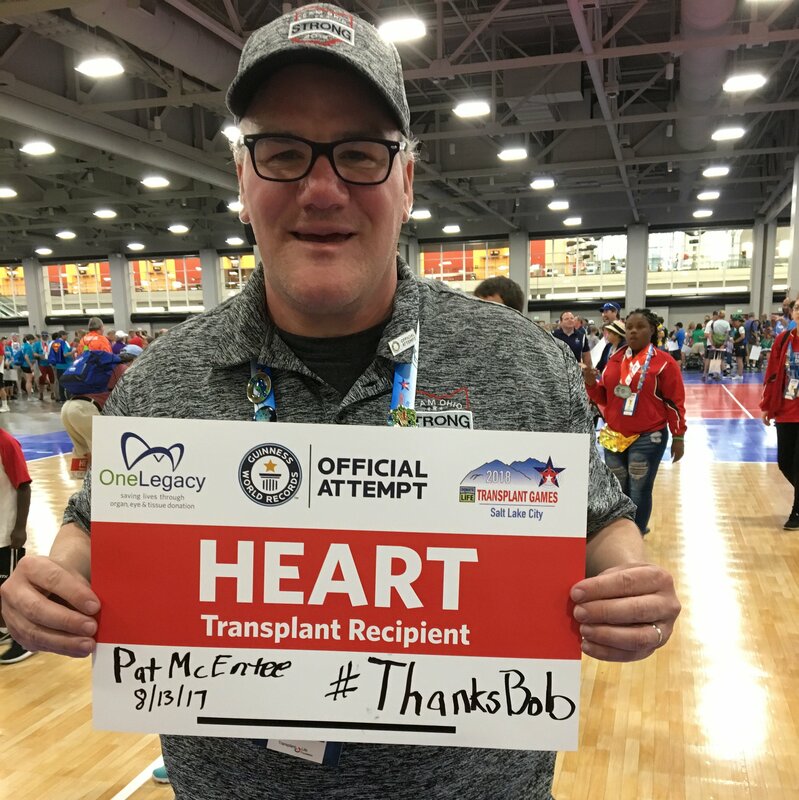 August 13 is the day I consider my transplant day because that’s the day Bob’s heart found its new home in me, so that will be my first birthday! I promise to try to be better about updating more often. As always, please pray for Bob’s family as they continue to mourn his loss. Two months ago today I was waking up from what, in all reality, was a 3-year-long dream. Today, I spent the morning having breakfast with my wife, and amazing caregiver, Amy. We followed that up by strolling through the park, and walking around the lake at Carriage Hill Metro Park. Every time we go for a walk, I am thankful again for my donor and donor family. I am in awe at how good it feels to walk. I don’t have to stop to catch my breath every couple of minutes. The only stops we made were to enjoy the nature around us. Not once did we stop because I was winded. All I can think of was how I used to have to strategically plot out my route from point A to point B to conserve energy. An economy of steps to get me to a point of rest was what I needed. Now, I just go and marvel at how easy it has become. Every day, I wake up thankful for this gift. Every night I go to sleep thankful for this gift. It is nothing short of a miracle. I sent a letter to my donor family about a month ago, and hope to hear back soon. Please, as you continue to pray for me, also continue to pray for my donor family. I think of them often and how they are coping with their loss. I wonder how many other’s lives my donor saved that day. Well, it happened! It really, really happened! God found the right heart for me and at the right time. For nearly the last three years, I’ve been patiently waiting. I said over and over that I kept meeting people who were sicker than I was and that needed those hearts that came along more than I did at the time. My line always was “when I need it most, my time will come.” And as much as that may sound like guarding against disappointment, it truly was not. I am so blessed to have had 1066 of the 1068 days with the LVAD that gave me the luxury to patiently wait and to fully trust that God had the plan in order and all would work out. And it has. As much as I have been overcome by the outpouring of prayer, generosity and simple/not so simple ways I have been supported throughout these last three years, I’m bowled over again and again this week as I see our Facebook posts border on viral, cards, gifts and visitors travel 4-8 hours to spend some time with me as I rally. I’ve also been visited by the Moser family who adopted us sight unseen three years ago when I unexpectedly received my LVAD. I had a place to stay for the duration of time I had to stay in Cleveland after discharge. I had a place to stay every time I traveled to Cleveland for follow up appointments. And, yes, when I get discharged (likely at some point this week, I will go to the Mosers abode “Miss Daisy” style in the back seat of the car with a pillow protecting my sore chest. This week will be all about educating myself and Amy for the changes that we will now face with whole new and different lifestyle, medicine regimen and more. I don’t know when I will be able to return to the workforce. It sounds like at least a year. When I am fully ready for that transition, I don’t know where God will call me, but I must admit my time volunteering in promoting organ donation seems like an avenue to explore. On Saturday, August 12 at 12 am on the dot, Pat received the call that a heart may be available for him. We were instructed to arrive at 7 am. Unable to sleep after that news, we arrived at 5:30 am. Around 1:40 pm, we were told that it was a go, and Pat rolled down to the OR at 7 pm. At 4:45 am on August 13, the surgeon told us that Pat had received a beautiful heart, everything was stable, and they were closing him up. We are so grateful for the heroic and generous gift that we’ve been given by Pat’s donor and their family. We are humbled, overwhelmed, and incredibly grateful for the love and support we’ve been shown by our family, friends and even complete strangers. Early in the morning on Wednesday, July 19, Pat suffered a minor stroke. After waking up on the floor (yeah, we don’t know what’s up with that, either, but it doesn’t seem that he fell)… Anyway, after waking up on the floor and struggling to get up, Pat called 911 for himself (I was out of town) and was transported by ambulance to Kettering Hospital. After several hours and a CT scan, he was admitted to Kettering. Several phone calls later and it was decided that he would be transported to the Cleveland Clinic. Pat got a helicopter ride to Cleveland (which included a stop for gas!) and I hopped on a flight back to Dayton, then drove to Cleveland. So, where we at, Frank? The most frustrating part of this whole ordeal — for us and his whole medical team — has been that Pat has been on blood thinners (and aspirin!) and in therapeutic range and this still happened. Quite frankly, we don’t want to wait around to see if it can happen again — we need Pat to be transplanted sooner rather than later, as the risks related to the pump have increased — so Pat’s cardiologist petitioned the committee to move him up on the list. He is now upgraded to level 1A. Every two weeks, his cardiologist will have to resubmit to the committee to keep him at 1A. From our understanding, there is one person ahead of him of a similar build and blood type; however, the list changes frequently. Additionally, to hopefully prevent stroke, the LVAD team and Pat’s cardiologist would like to run his coagulation rate in the thinner range, so he’ll be here at the Clinic for another few days, at least, as they get that all sorted out and monitor his labs. We are grateful for the concern, compassion, and thoroughness of our team at the Cleveland Clinic. As always, we are grateful for the love, support, and prayers of our friends and family. You sustain us through these wild days. Please continue to pray for us, for Pat’s donor and their family — we pray for you, too. Today marks my 1000th day on the heart transplant waiting list. On September 9, 2014, I knew my case for being listed was being heard. I also knew that I was highly likely to be listed. If you had asked me or my doctors a week before that meeting, we all would have said I’d be listed at level 2 (the lowest priority level). As it turns out, I was unanimously approved to be listed at 1A as my condition was deteriorating rapidly. I was on bed rest at this point and couldn’t even get up to go to the bathroom. Two days later, I had my LVAD implanted which moved me down to level 1B on the transplant list. As I indicated in my post on Opening Day of the 2017 baseball season, my doctor and I decided to activate the 30 days of 1A time that I had at my disposal because of my having an LVAD. The idea being that they would like me to be as healthy as possible at the time of transplant. We also wanted to be stretegic about using the 1A time and at that time, there wwas no one with my blood type and body style ahead of me. Unfortunately, my blood type is rare enough that it was not a guarantee that I would get transplanted in those 30 days. Sadly, that time came and went without so much as a false alarm call. The good news is, that if my condition deteriorates to a level which would require me to move back up to 1A, I will have my 32 days of time accrued at 1A, which should help put me closer. Throughout my journey from the time of being listed to now, I have been very intentional to look at the bright side of things. First and foremost, I recognize that without the heart pump or a transplant, it’s highly likely I would not be alive right now. Everything is bonus time, and I am determined to make the most of my time and to make a positive impact in the world with whatever time I am given. I know I’m in the overtime period of my life. It’s hard to imagine what my situation would be like if I didn’t have the tremendous network of support that I do have, between my wife Amy, family and friends. I know that there are those in similar situations who do not enjoy the same support that I do. I also have had, and cherish the opportunity to visit people who are physically in much worse shape than I am to share my story as they wait to receive a heart pump and/or a transplant. All of this said, I am finding it more and more difficult to do many of the things I would like to do. For a time, I was able to excercise regularly and thus managed my weight fairly well. Little by little over the past year, I have not been near as dedicated to that. In turn, my weight has increased and thus it becomes even harder to exercise. Further, I have not been as good at controlling my sodium intake, and thus some of my additional weight is water retention. I suppose its a cycle that is tough to break out of when your enegy and stamina are very low. I do try to remain as actve as possible and much of my volunteering has helped that to remain the case. However, I am finding more and more that I need recovery days after any particularly active day or days. Although I am not surprised that I did not receive the call during my 30 days at 1A, I can’t pretend that I am not disappointed about it. These 1000 days have been long and, at times very trying. I find myself battling the emotions often. I want others who need it worse than me to get theirs first. I want my future donor to have more time with his family and hopefully make a meaningful impact on his family, friends and the world before he passes the torch to me. On the flip side, I want to be be able to say, “I feel great” when someone asks me. I want to get on with my life by returning to work doing whatever it is that I will do when I am able again. O want to be able to travel with Amy again and not be limited by my inability to walk long distances, or climb lots of stairs. It’s been a while since I publicly thanked all of those who have contributed to my Help Hope Live campaign, so I want to be sure to do that again. I am blessed beyond belief for all of those who have helped support us throughout this continuing journey. As always, I ask for your prayers for Amy and me. She continues to be a rock of strength through this. And please, pray for my future donor and his family. When my phone rang this afternoon with a 216 (Cleveland) area code, I took a big gulp when I answered it. It was NOT “The Call” but it was a call to activate my bank of 30 days of 1A time. Typically in order to be listed at 1A, a patient must be in the hospital and in bad condition. I have had the good fortune to be relatively healthy and free of complications in the 2 1/2 years with my LVAD, so moving up was never necessary. Because I have an LVAD, and studies show patients who go into a transplant healthier, have a better chance of doing well through the transplant and beyond. Thus, they decided to grant all LVAD patients a bank of 30 days of 1A time to use when they are not in a dire situation. The only patient listed at 1A with my blood type and body style was recently transplanted, and thus, we decided to activate my time to take advantage of the window. Please understand, this does not guarantee I will be transplanted in the next 30 days, but it gives me a better chance of that than otherwise. The man who was standing in my way of activating the 1A time waited five months before he was transplanted. The consolation prize if I do not get a transplant in the next 30 days is that I still accrue that time at 1A, so in the event my condition would deteriorate to the point that I needed to be moved to 1A again, I would be ahead of anyone who was recently added to the 1A list. Please continue to pray for me and my future donor. I am a bundle of nerves at the moment! Hi everybody! Today is February 14, 2017, Valentine’s Day! It’s also National Donor Day. Further it is the 890th day since I was added to the waiting list for a heart transplant. While it is likely I will have to wait another year or more, I am optimistic that God will provide when I need it most. I know many people who are in much more desperate need than I am right now. I am so grateful for the gift I have been given of my LVAD, which was placed in September of 2014. WIthout it, or a heart transplant, I would not be here today. With it, not only am I here, but I am able to function and be relatively independent. Although I am unable to work, I am able to drive. I am able to do my own dressing changes and have, thank God, been free from infection since I had the heart pump placed. I have also been able to do some volunteering with LifeCenter in Cincinnati and Life Connection in Dayton. This has brought me great joy to share my story, listen to others who have been affected by transplant in some way and spread the news of the great need that still exists for registered organ, eye and tissue donors. Please, on this National Donor Day, take the time if you haven’t already, register to become a donor. You can save up to 8 lives with your gift, and can positively affect hundreds of others. Not only is it the recipient’s life you will change, it is their family, friends and anyone who comes in contact with them that will be affected. Organ donation is an amazing way to leave a tremendous legacy. This week, I will head to Cleveland for a series of what I hope will be routine follow up appointments. It includes a right heart catheterization, which is the best test to see the current condition of my heart function. As always, please continue to pray for Amy and me. Please also pray for my future donor and his or her family. Give Love. Give Life. I figured National Donor Day was a good excuse for a video update. See. I’m not such a luddite! Here are some FAQs about HelpHOPELive and why we are using them for our fundraising for Pat’s Heart Transplant. ****Why are you fundraising? Don’t you have insurance? -Copays (Pat sees a lot of specialists at $30 a visit). -Meals for me when Pat is in the hospital: We are fortunate enough that our dear friends in the Cleveland area provide us with a place to stay; however, a girl’s gotta eat, and, while there are some delicious options at the Clinic, it’s not exactly cheap. ****How is this different than a GoFundMe page? HelpHopeLive is a charitable foundation, not just a fundraising page. -In order to establish a HHL fundraising page, catastrophic illness or injury is verified by a medical professional. Anyone, well-intentioned or not, can set up a GoFundMe account. -All contributions are tax deductible. HHL is also able to allow for matching funds from employers, where applicable. -HHL has a lower overhead and processing fee than GoFundMe. They only take 5% of contributions and 7.65% of credit card transactions. At least 92 cents of every dollar donated goes toward Pat’s medical expenses. -HHL pays directly to medical providers. They only pay us reimbursements for meals, gas, or other transplant expenses when verified by receipt or proof of services received. -Because HHL is a foundation that pays directly to medical providers, the contributed funds do not count as income that impacts our taxes or Pat’s eligibility for medical disability. ****You’ve said it could be another year or more until Pat is transplanted. Why are you fundraising now? Because that’s what our social worker, Kay, told us to do! In all seriousness, we were advised to begin fundraising while Pat is doing relatively well so that we don’t have to worry as much about the financial aspects of transplant when a donor heart becomes available. While the funds are available to us now — and we have requested one reimbursement over the last two years — we’re pretty committed to leaving them there until we most need them — when Pat is transplanted. ****Can’t I just give you money? Well, yes, you can. And we appreciate that, too. Processing your contribution through HHL simply ensures that your donation is tax deductible and that it goes exclusively toward medical and other transplant related expenses. If you give it directly to us, it may end up being used to pay our rent or for other purchases, because we just put it in the bank. If you have any other questions, please ask and we will be happy to answer or find the answer for you. When I had my LVAD implanted on Sept. 11, 2014 I was told I could expect to wait a couple of years for a new heart. It’s now been a couple of years and by all indications, I’m not particularly close still. This doesn’t upset me, but it hammers home the need for more people to register to be an organ donor. I continue to be immensely thankful for the technology that has kept me alive for the last two years and I continue to pray for those who are in much more dire need of a new heart than I currently am. I hate knowing that 22 people die each day waiting for a transplant. I have been doing more and more volunteering to promote organ an tissue donation in the Dayton area and the Greater Cincinnati area. I look for every opportunity to share my story in the hopes that more people will register. There are many myths and many more cop outs that I encounter each time. People need to take the time to explore the facts. ANYONE can be an organ donor. Let the doctors and medical professionals decide what they can and can’t use. This week, it hit the news that former Cincinnati Bengals coach Sam Wyche was in the hospital facing the exact same thing as I was two years ago. They are hoping to wait for a donor heart, but daily they are making the decision if he will need an LVAD. This had me again reliving my experience two years ago and the incredible whirlwind that occurred. I still can’t get over the fact I walked the length of Niagara Falls a week before I was told not to get out of bed. I still don’t know if I crashed that quickly or if I was just masking how bad my situation had become so well. Perhaps it was a combination of both. Also, last week, a local mother was faced with the most difficult decision. Her son was killed as a result of a gunshot wound. He had expressed the desire to be an organ donor and she honored that decision. In talking about it, she hoped she would meet the recipient of her son’s organs, particularly his heart and his eyes. It was incredibly touching and it makes me continue to remember the other side of what I am looking forward to. It’s such a difficult thing to look forward to receiving my new heart knowing how much pain it will cause to another family who will have to say goodbye to a loved one. I know it’s been a while since I posted. Not much has changed. I am still able to function and come and go as I please for the most part. However, I don’t feel quite as good as I did a year ago. I am excited that my trips to Cleveland have lessened. I am now only having to go once every three months. Sorry if this seems like a random collection of thoughts, because it is. As always, please pray for Amy and I as well as my future donor. Thank you all so much for your prayers and support. Tomorrow, Amy and I will drive to Cleveland once again. Only this time, we are not going to follow up appointments, blood tests or other heart related issues. In fact, there is a strong likelihood, I won’t go to the Cleveland Clinic at all on this trip. No, we also were not gifted with tickets to the NBA Finals that will be happening in Cleveland tomorrow. Instead, we are going to witness the 2016 Transplant Games of America. I am not eligible to participate as I have not received my gift yet. However, I will get to meet so many other inspirational people and watch them compete in Olympic style events. Having already made friends with several transplant recipients through my volunteering, I can’t wait to cheer them on in whatever events in which they will participate. From everything I have heard from those people, this will be a magical experience for all involved. I can’t wait! There is one event in which Amy and I can participate and we will. I will walk the 5k (hopefully) and Amy will run the 10k that goes along with this event. Please keep us and all of the participants in your prayers for safety and success! After about six months free from Atrial Fibrillation, I received a call last week letting me know that my remote monitor sent my doctor a transmission that determined my heart had gone back into AFib. I already had appointments scheduled with my LVAD clinic and my cardiologist, so I hoped I could add on an appointment with my electrophysiologist to determine the best course of action. Unfortunately, I am still in limbo as I have had a very difficult time getting a response from my EP doc or anyone in his office. So I will drive to Cleveland with Amy tonight for appointments in the morning. Amy is going with because of the possibility of my being cardioverted (aka rocking down to Electric Avenue). If that is done, she will have to drive me home as it is illegal for me to drive for 24 hours after anesthesia. Anyway, please keep us in prayer as we see what’s up tomorrow. As always, please keep my future donor and his or her family in prayer also. Tomorrow I will attempt to tackle my second 5k since I’ve had my LVAD. I don’t run, but if intend to walk. Team Patulence is growing in numbers (we are at 5 who will compete this event to raise awareness of the need for more registered organ donors.) Amy and I will be joined by Amy’s mom Robin, Amy’s sister Emily and my sister Peggy. We hope more will join us in future events such as the Gift of Life Run and Walk which will be held as part of the Transplant Games of America in Cleveland this June. I am thrilled to be able to participate in this. I have been working to get myself in shape for it. I have been using the recumbent bike all winter and am well over 500 miles on it for the year. However, that exercises my legs and not much else. Since the weather has been warmer of late, I have been getting out to walk periodically. This has been more of a struggle than I expected and concerned me as I prepare for tomorrow’s 5k, but it did get a little easier after the first couple of times out. I won’t have a great pace tomorrow for sure, but I should finish. Wish me luck! Three months. If all goes well (and I don’t get “the call) I don’t have to make the trip to Cleveland until May. I had an appointment with Electrophysiology on Monday and I continue to have only minimal blips of Atrial Fibrillation. The medicine Tikosyn that I was prescribed in November is doing it’s job. It’s a high cost per month, but it is allowing me to continue be as active as I have been in the past few months. In addition to feeling better and being able to exercise at a threshold that is allowing me to stay as strong as possible so that I am in good shape to receive my new heart whenever that may be. I also had to visit with the LVAD Clinic while I was at Cleveland Clinic. This is for a battery malfunction that has been a recurring problem for me. I have had all my batteries replaced in the last three months, yet I am still having periodic disconnects due to some unknown problem. It is important to note that my pump has not stopped through this ordeal. That’s why I need to keep two batteries connected at the same time. One is a backup. I have always worn a belt to hold my batteries as it allows me to keep my hands free. They have asked me to try wearing the shoulder bag, at least for a time to see if that might help. I asked if this type of thing is happening to other LVAD patients. They told me no, but that there probably isn’t anyone they have that is as active as I am. So there’s that. I suppose I should be happy that this is the biggest problem I am having with the LVAD. There are others that have had much more difficulty with their’s. As for my activity, I am continuing to keep pace on my bike miles. Recently, with the weather being as nice as it was over the weekend, I’ve begun walking more (in addition to the biking). I have found that I struggle quite a bit with the walking compared to where I was several months ago. I suppose being on the recumbent bike only exercises my leg muscles. Walking uses other muscles and also requires me to carry all my girth. God bless you all! Please keep the prayers coming for us, our doctors and my future donor! On Monday, I returned to the Cleveland Clinic for routine follow up appointments with my LVAD team, my cardiologist and my bone doctor. Next Monday, I will return for a routine follow up with my Electrophysiologist. Per Dr. Mountis, my cardiologist and my LVAD team , I won’t need to return for three months. Per Dr. Su, I won’t need to return until September for a 2-year bone density scan. If all goes well with the Electrophysiologist, I likely won’t need to return for at least six months. So barring anything unforeseen, after my appointment next Monday, I may not have to go back to Cleveland until late Spring! As lovely as everyone is at the Cleveland Clinic, I am very happy to not have to make the 7 hour round trip nearly as often as i had been. Of course, as I continue to wait for “The Call,” I know that I may make an unscheduled trip at any time. Not much else to report at this time. I’m still plugging away at my New Year’s resolution to bike 2016 miles this year. I am up to 260 miles which puts me ahead of pace to make my goal. Above is a link to my blog. I am not the most faithful blogger in the world, but updates on my life and situation can be fond there from time to time. Please take a look. 2015 has come and gone without a new heart for me. It was not a bad year, though. I continue to feel very fortunate that my complications with the LVAD have been relatively minimal to this point. I did battle with atrial fibrillation for the better part of the year, and it did make an impact on me, but by comparison to so many other LVAD wearers and other people awaiting transplant, I couldn’t really complain. In my last update, I mentioned that I was going to be hospitalized for a few days while they started me on a new medication (Tikosyn) before cardioverting me. Unlike my cardioversion in the summer, this one has lasted more than 12 days. It has now been about two months. Keep your fingers crossed. A drawback to this new medicine is the cost. I was stunned the first time I picked it up from the pharmacy when I was told it would be $60. I asked if it was covered by my insurance and they said that it was. The normal price for the prescription is $600 a month! Gulp! This brings my monthly prescription bill to well over $150 per month. This is one of the reasons why this campaign was begun. Try as I might, remaining in my fitness program became more and more difficult while I was dealing with A Fib. When I exerted myself, I felt uncomfortable and became winded very easily. 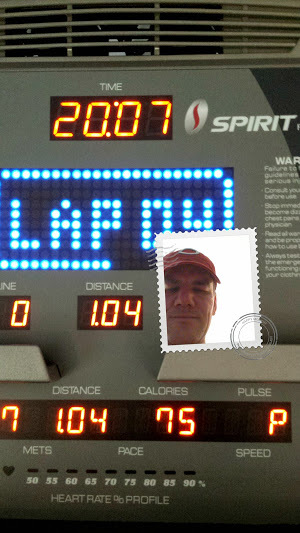 Now that I am in a normal sinus rhythm, I am able to be more active and build stamina. Since the new year began, I decided a resolution would be to set a goal of riding our recumbent bike 2016 miles this year. That will require me to average roughly 5.5 miles per day, which is about a half hour. Thus far, I have kept close to this average and I have found it is getting a little easier each time I ride, which means I am getting in better shape. Still a long way to go on that front. As I have shared before, I continue to be amazed by the generosity of so many people. In talking with our social worker last year, we were told to work to raise money before the transplant as much as possible because at the time of transplant and the immediate aftermath, the focus obviously needs to be directed elsewhere. I had no idea I would be gifted so much so quickly. I have already surpassed $20,000 in donations and that is from dozens and dozens of donors. These donors include family, friends, acquaintances, friends of friends. This has meant so much to Amy and me as it has allowed us to rest a little easier knowing that many of the expenses we would have to fret over, can be covered. Beyond all this, there are prayers. It seems like every day someone tells me that hey are praying for me. Many of these people tell me that they pray for me daily. It is so humbling to know that I am remembered daily and that God is reminded that I need help! So I’ve said it many times, but I will say it again. Thank you! Thank you! Thank you! As always, please pray for my future donor and his or her family. Monday morning (Nov. 9) I will drive to Cleveland to be admitted to Cleveland Clinic for four days (if all goes according to plan). The saga for the majority of 2015 has be my battle with atrial fibrillation. I went into A Fib at some point in March. Because of my history of stroke (one in 2005 and one in 2006), I had to have my INR (Coumadin level) between 2.0 and 3.0 for 8 weeks (as opposed to the normal 3 weeks). As a result, I was not cardioverted until July (Ironically, I fell out of range that morning for the first time in 8 weeks. Had it not been for the tremendous efforts of one of my nurses, I would have gone home that day and had to wait another 8 weeks. The bad news is, for all of the efforts of so many medical professionals that day, I went back into A Fib just a couple of weeks later. So, the next step is to try medication to help keep me out of A Fib (at least for a longer stretch than 2 weeks). In order to do this, I have to be monitored to be sure I am tolerating the medication. Thus, I am heading to Cleveland tomorrow for this process. I am thankful that my A Fib is less symptomatic than many who suffer from it. I was able to schedule this at my convenience, rather than be an emergency situation. Please keep me in prayer this week, that all goes well and I can get myself back to feeling the way I felt in late winter and early spring of 2015. Thank you for the support you give. This will help us offset the travel costs of this journey and the added prescription costs to the medications I already take on a daily basis. Today, the world remembers the horrific events of September 11, 2001 when the World Trade Center buildings were toppled in New York, the Pentagon was crashed into in Washington DC and a 4th airplane crashed in a field in Pennsylvania. So many lives were lost and our nation has never been the same. Today, I recall another anniversary. My first LVADiversary. Both of these events still seem surreal. They both happened so quickly, it almost feels as if they were a dream. Given the fact that my brain was not receiving adequate blood supply last year, many things seemed like a dream…if I could remember them at all. In the year since I had my LVAD implanted, I have encountered many ups and downs. Praise God that there have been many more ups than downs. The ups are that I have been healthy enough to lead a semi-normal life. I have a tremendous network of support, care, prayer and love. I have been able to be a support to others who face similar situations. I have been more committed to staying active and in shape (although it’s always a constant battle). The downs have been minimal in comparison. I have had to battle very occasional pain and discomfort. I have had to get used to wearing my “utility belt” at all times day and night. I have had to learn how to do my dressing change, which has to be done daily. When I travel, I have to pack up all my supplies even if I’m just going to be gone for a night. The biggest difficulty has been having to leave my job at Glenmary Home Missioners. As with the events of 9/11/01, I looked forward with much hope and a little fear, so to do I with the events of 9/11/14. Both illustrate clearly that nothing is guaranteed in this life. Both also illustrate how some of the best in humanity can come from the lowest points. I have certainly experienced amazing support from family, friends, acquaintances and even strangers in the past year. Thank you all for your continued prayers and support. I recently noticed a large anonymous donation on my HelpHOPELive campaign and I wanted to take a moment to thank that individual or group for his/her/their generosity. I have tried to send a thank you card to all of my donors (let me know if you did not receive on if you donated). When the donor is anonymous, however, I cannot do so. That does not make my appreciation any less. This is also not the first anonymous donation I have received, so again, thank you to anyone who has supported my campaign. My spirits are high. I continue to follow up with the LVAD team and other doctors at Cleveland Clinic in anticipation of my new heart. As a result of my most recent visit, I am reminded that there are many more people in need of a donor heart. I always ask prayers for myself, my wife and my future donor and family. I am reminded that we also need to pray for those who are in much more dire need of this tremendous gift than I am at the moment. I met two men during my visit who will not be able to leave Cleveland Clinic without a new heart. I also found out that there are well over a hundred other patients wearing an LVAD from the Cleveland Clinic. On August 8, Amy and I participated in the LifeBanc Gift of Life walk in northern Ohio, not far from Cleveland Clinic where I will someday receive a heart transplant. We thought it was a 5k, but it turned out the walk was not that long, so we continued walking around the grounds until we could truly call it a 5k. I did not make it publicly known prior to the event, but my heart had decided to go back into atrial fibrillation about a week prior. This is obviously disappointing. I had only been cardioverted out of it a few weeks earlier. I had begun to get myself back into shape and on a regular exercise routine. I was afraid it was going to cause me to have to miss this walk that I had looked forward to. The electrophysiologist who is monitoring this for me is out of the country, so I am in a holding pattern as to what they will do. It seems likely that they will attempt to use medications to give me a better chance of staying out of the rhythm in the future, with the possibility of another cardioversion. I did talk to my cardiologist and my LVAD team to be sure it was ok to continue my plan to walk, and they all agreed that I could do it as long as I felt good, which I did. I am determined to continue to exercise through this and not allow myself to get in the rut I did the first time I was in A Fib. Please continue your prayers and support. Please post to my guest book. God Bless! Tomorrow (Tuesday) morning, I will finally have my cardioversion appointment in Cleveland to get me out of the bout of atrial fibrillation I have been in for about four months now. Please keep me in prayer at that time. Also, please pray that this allows me to feel better and have more energy. I am hopeful to ramp up my exercise routine as it has certainly declined since early spring. As always, I want to thank all of my donors. Every time I watch my fundraising thermometer rise, I continue to be stunned and humbled by the generosity everyone continues to show! Please sign my guestbook too! I have decided to revive my heart transplant blog “Working Heart or Heartly Working.” Here is a link. There will likely be a lot of cross posting, but this gives another avenue to keep up to date on the latest happenings of my journey to transplant. Next week, provided my Coumadin level stays in range, I will finally be cardioverted out of atrial fibrillation. Although I am able to function relatively well with it, it has slowed me down considerably in terms of how much I am able to exercise. I am hopeful I can get back to where I was in the late winter and early spring and continue to progress up from there. Thanks for the prayers. Please keep them coming! It’s been nearly 10 months since I was added to “The List” of those awaiting a life-saving heart transplant and had my LVAD (heart pump) implanted. Obviously, it has not been without its struggles, but I continue to be thankful for this device which has bought me additional time while I wait for a donor heart to become available. In all seriousness, this is the fact that I have the hardest time dealing with as I approach transplant: Someone has to die in order for me to be able to have a longer life. I’ve been a registered organ donor from the time I got my driver’s license when I was 16-years-old. I know that there is no need for me to take my organs with me when I go. Now that I have developed heart and other related problems, I know much of what I have will not be worthy of passing on, but whatever is still good when I do go, I hope will give life or a better quality of life for as many people as possible. When a loved one passes away, how many times do we find comfort in the knowledge that our deceased loved one isn’t gone as long as they stay in our memory? Through organ donation, you can literally live on by providing others with a second chance at life. If you’re not a registered organ donor, please consider becoming one. Make sure your loved ones know of your wishes. Please continue to pray for Amy and I as we travel further down the road to this new adventure. But please also pray for my future donor and his or her family. I checked my fundraising page and was shocked to see a very large donation made to my page. I have tried to mail a thank you card to all my donors, but this donor chose to remain anonymous. I want to publicly thank this person (and all my other donors who I have had a chance to mail a thank you card. To update you on my situation with atrial fibrillation, I am still in it. I have an appointment with the electrophysiologist on Monday and will hopefully have a concrete plan. I can be cardioverted, but I am not sure that is going to be their first plan of action. This has changed from what my understanding was before. I want to reiterate that the limitations this puts on m is minimal. I am still able to complete most day-to-day activities, and I am able to exercise. However, I don’t have the endurance that I had prior to being in A Fib. Thank you again for your prayers and support. Please keep checking back to my page and leave me a note in my guest book, even if you aren’t able to make a donation. Hi gang. It’s been a couple of weeks since I posted an update. First of all, I want to thank all of you who have contributed to my campaign on HelpHOPELive! I am truly overwhelmed by the generosity that has been shown thus far. Every contribution, large or small, is helping me face my impending heart transplant. The money itself obviously helps pay the bills that continue to roll in. However, the emotional lift I get when I see another donation come in can’t be understated. I have literally been moved to tears when I see the counter climb and the people who have made that happen. So, here is the latest update. The juggling act that is my heart has decided that a bout of atrial fibrillation is in order. Atrial Fib basically means that my heart is in an irregular rhythm and although sometimes it comes and goes, in this instance, I have been consistently in A Fib for several weeks. This was discovered upon an interrogation of my pacemaker/defibrilator. For me the effect of this has been symptoms similar to my heart failure that led me to being listed on the transplant list, although much less severe. I have less energy and ability to do exercise to the extent I was able to a couple of months ago. I AM still able to exercise, though. Amy and I have gone on walks and we recently bought a second-hand recumbent bike for our home. I am able to do these, but not at the pace I was able to in the winter. In order to get my heart out of Atrial Fibrillation, they are going to have to cardiovert me out of it. This will likely be done by hitting me with the paddles (I will be briefly sedated for this). Unfortunately, they were unable to do it right away because I am a coumadin patient. This drug is an anti-coagulant. At the time, I was not in a therapeutic range. If a clot has formed in the heart, jostling it with paddles increases the possibility of a stroke. In order for them to cardiovert me, I have to be therapeutic for 3 straight weeks. I am about a week away. If I fall back under 2.0, I’d have to start the clock over, so lets hope that doesn’t happen. Thanks agan to all of you for the support and prayers you have and continue to show me. Please feel free to leave comments or questions. I will do my best to answer them. If my waiting for a heart transplant wasn’t proof enough that God wasn’t finished with me yet, maybe I got another indication last night. It’s always a little bit of a challenge to shower with my LVAD, but I manage ok most of the time. Last night, climbed into the shower and after shampooing my hair and reaching for the body wash, I started to lose my balance when the floor mat shifted a bit. I though for sure I was going down and was just trying to fall in a way that would cause the least damage. I had my face toward the shower wall and was going backward through the shower curtain to the bathroom floor. As best I could tell all doors were closed and I’d have a clear, but far fall. I threw my arms up as if I could catch myself on the curtain. To my surprise, I did stop and did not fall. After taking a deep breath, I finished my shower, felling very thankful that God’s hand kept me from a near tragedy. Last night, I was honored to be able to stand as my goddaughter Ainsleigh’s Confirmation sponsor at St. Patrick’s Shrine in Taylor Mill, Ky. It was a beautiful ceremony and I was so proud to see her take that step in her faith life and loved hearing why she chose St. Elizabeth of Hungary to be her Confirmation name. My ability to even be there is all due to the LVAD I had implanted in September 2014. Without it, I may not even be alive right now, let alone be able to stand in as Ainsleigh’s sponsor. The LVAD is wonderful and has improved my quality of life immensely, but it has it’s limitations. My heart is still weak and can continue to deteriorate. It also is cumbersome as I have to wear a belt that carries a controller and two battery packs that connect to the drive line in my side that connects to the actual device. Believe me, it is a small price to pay. Still, I look forward to receiving a donor heart when that time comes. I have been blessed to be present for all three of Ainsleigh’s Sacraments of Initiation. She was also present for my wedding. I pray that I will be able be there to share more sacraments with her. That will only happen with the grace of God and the help of a generous organ donor, numerous doctors, nurses and others involved in the process, and the prayers and support of so many people I know and many even that I don’t know. This is not really an update. It’s actually a bit of a retrospective of the events of last summer that led me to now. Late last Spring, I went for a visit with my cardiologist. He didn’t like what he saw in my exam and he decided to admit me to help me get some fluid retention under control. After I was sent home, he wanted me to have a pulmonary stress test to decide if the time was right to refer me for transplant evaluation. I failed that test miserably. Eight minutes in, at a moderate pace, I passed out on the treadmill while it was still running. So a couple of skinned knees and an emergency room visit later, I barely got out in time to see my cardiologist across the street.. We decided it was time to look explore transplant. That led me to be evaluated in Cleveland. Part 1 was in August and part 2 was in September. In between, Amy and I got to finish a bucket list item of mine by going to the last two MLB ballparks I hadn’t been too (New York Yankees and Toronto Blue Jays). I also got to spend my 40th birthday at the Baseball Hall of Fame. During that trip, I did a lot of walking, although it was slow and exhausting for me. When we returned to Cleveland for part 2 of my transplant evaluation, I walked all over the CLeveland CLinic campus to a variety of appointments. The last of which was a right heart cathterization. This test did not go well, and my cardiologist recommeded admitting me so they could again get my fluid retention under contral and find the right balance of medicines to control my declining heart. That did not work and it became clear I was in much worse shape than I thought. Within days, I was put on bed rest, added to the heart transplant list, hed a baloon pump put in followed by my LVAD implantation. I entered the hospital on September 5 and didn’t leave until October 5 as I had to recover from the open heart surgery. While I wait for my heart transplant, with the help of the LVAD, I am able to exercise and am doing so by spending at least an hour at the gym three days a week. Now that the weather is getting nicer, I am also getting out to the park occasionally. Check out some pictures from my escapades in my photo albums. Transplant Alliance Foundation, is proud to supply financial grants to help pay transplant related medical bills. Lifting you up in prayer ! Pat, I continue to include you in my prayers. I will add you to our prayer chain in our parish. Have a great walk tomorrow Pat, way to keep working toward your goal. Remember my race motto, slow and steady finishes the race! Hi Pat, I've followed your story through your sister Kat. She has been a blessing to our family and our family will pray for your complete healing! Cheers to a heart healthy 2016! Yo, Pat! I'm so happy that you and Amy came into our lives. It's heart to believe that it has now been over a year since the first time you walked in to realize our dog is the worst but we make great tea. Every time you're around there is guaranteed to be good food and mediocre humor. You have both been positive lights in my life, and for that I truly thank you. Pat I know you've been such a great friend to my little brother, Zach. I hope for you and your family and friends to continue strength and peace throughout this ordeal. I'm glad you've found such a strong supportive medical team, too. Good luck to the future, Pat, and know that you have friends in OK thinking of you. Thinking and praying for you and Amy often. You're like the older brother I never had. Happy Thanksgiving, my friend, and God bless you. You've touched the lives of so many - myself included. Love to you both! I haven't money, but, I can pray for you, your Doctors, Nurses, all involved in your care and your family. God Bless and keep You All. Pat, thinking of you often. Dave and I pray for you daily. Thanks for staying in touch, it means a lot. Lunch again soon?